Welcome to the website of Knotworks By Hart, wherein is showcased the beautiful interlaced artwork of J.G. Hart. We are pleased to feature our Rune Cards. These Rune cards are designed to be used as an oracle. They can give the reader insights in to what is influencing situations in the readers life and the currents at work around any given situation. 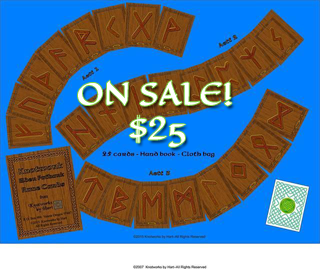 Our rune cards are currently on sale for $25! T-shirts Now Avalable! Check out our selection of T-shirts below; or in the categories to your left!